I had to write an article for our work’s newspaper. Due to lack of anything better to write about, I consulted my friend Wikipedia and wrote up this summary of their Chicken or the Egg article. Because I haven’t been blogging as much, and am way overdue for something – I thought to add this here. We’ve all heard the saying: What came first, the chicken or the egg? As it turns out, it’s one of the oldest debated dilemmas, as it was the topic which evoked a lot of questions on how life and the universe began in general. These days the statement is used to point out the futility of identifying the first case of a circular cause and consequence event. Inevitably, the question isn’t about the chicken or the egg, but about how one object can come into being without another of which it is dependent on. An egg can’t appear without a chicken, and a chicken cannot be hatched out of anything other than a chicken. Over the years, a couple of theories have evolved. 1)	Proteins – By analyzing protein synthesis in egg production, scientists concluded that there must’ve been a ‘first’ chicken, due to the proteins required to synthesize the formation of the egg’s hard shell. The fly in that theory’s soup is that the protein evolved long before birds branched away evolutionarily from reptiles. 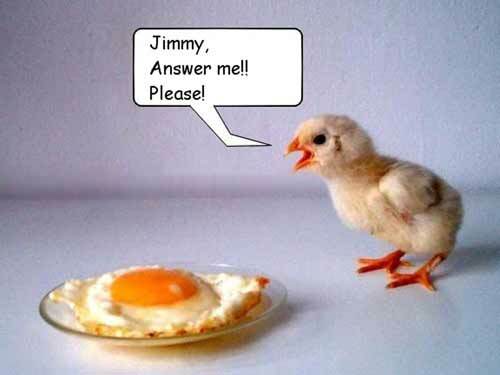 Thus proving that the protein was present before and after egg production. Many use this theory as proof of the futility of trying to solve this question. 3)	Evolution – Darwin’s theory of evolution states that species change over time via mutation and selection. Since DNA can be modified only before birth, a mutation must’ve taken place at conception or within an egg such that an animal similar to a chicken, but a not a chicken, laid the first chicken egg. With this theory, both the gg and the chicken evolved simultaneously. 4)	Theology – Naturally – God created chickens, and chickens laid the first egg. Therefore, the chicken came first. 5)	Cyclical view of Time – In the Buddist belief, time is regarded as cyclical and with repeating ages. The assumption is that time is eternally repetitive and therefore, there is no ‘first’ in eternity. So, really – none of these answers can be proven true or false. It’s the nature of the problem and why it’s fascinated the mind of philosophers ever since they went to collect their breakfast. The truth is that it doesn’t really matter in my opinion. Chickens are here now, as are eggs. And, for that we should be grateful, because without them – there are many people out there who would not have jobs.